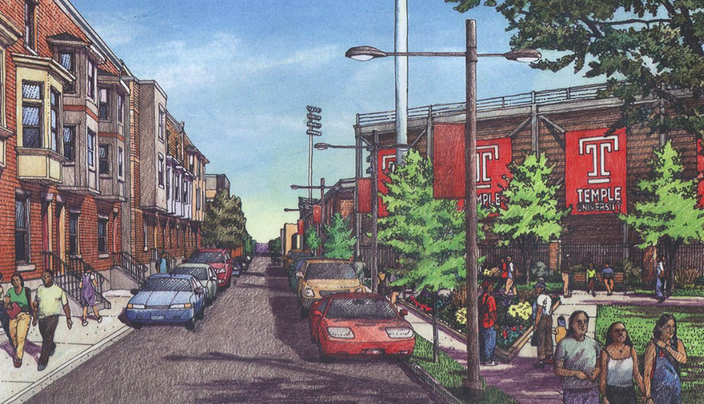 Two years after launching a controversial feasibility study on the prospect of building a football stadium in North Philadelphia, Temple University is giving the public its first look at the proposed multipurpose facility. Earlier this month, Temple President Richard Englert announced the university will move forward in the coming months with a project proposal submission to Philadelphia's City Planning Commission. The ambitious development has been met with consistent opposition from community groups, including the locally organized Stadium Stompers, who believe the project will ignore local input and negatively impact their neighborhood. Some students also have shared lukewarm interest in an on-campus stadium, the construction of which the university claims would be funded primarily through private donations and bonds. On Tuesday, Englert provided another update on the university's next steps as a proposal is prepared for the city. 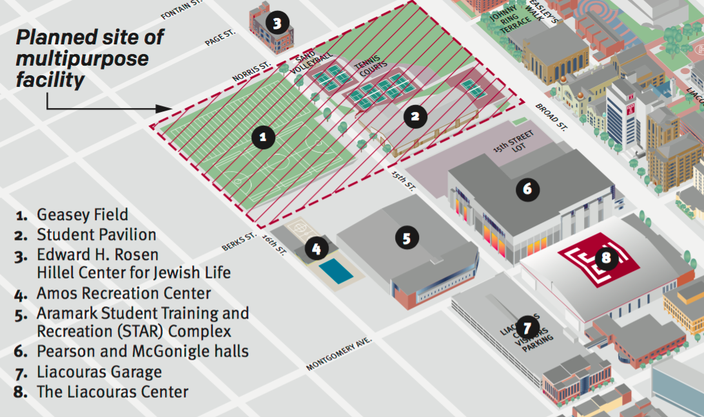 During the next four to five months, Temple will hold public and internal discussions with North Philadelphia neighbors, the university community and the city agencies overseeing the approval process. "I want to invite thorough and open comment in the best traditions of academia," Englert said. "A diversity of views is what makes a university great, and Temple is no exception. Respecting the academic calendar, the next three months or so provide the best opportunity to gather additional input." The proposed $130 million stadium, designed by architecture firm Moody Nolan, would be constructed at a site bounded by Broad Street west to 16th Street and Norris Street south to Montgomery Avenue, as shown in a new map released by the university. Opponents of the project believe the 35,000-seat complex would bring unwanted noise, burdensome traffic, parking problems and potentially more crime to the neighborhood. The university said this month it will organize a Special Services District around the project site to oversee dedicated maintenance and services for the benefit of the community. Designers also have been urged to minimize the impact of the facility's height, lights and noise, building the north end of the stadium no higher than the row homes on Norris Street. Temple's existing contract at Lincoln Financial Field runs through the 2019 season. 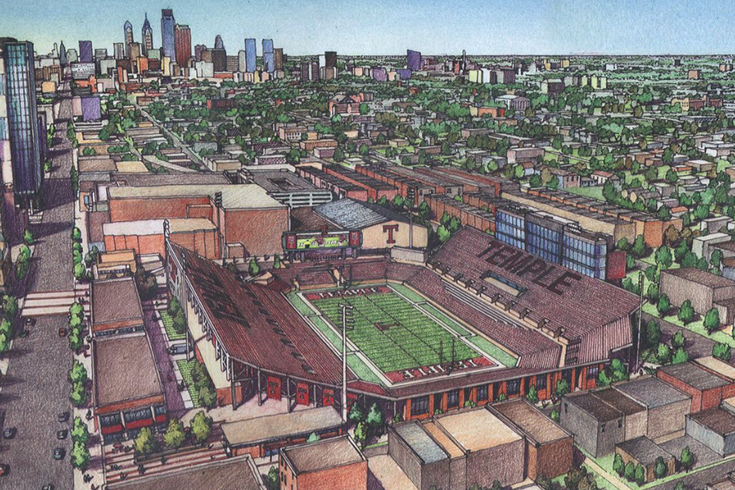 Earlier critics of the stadium proposal, including Mayor Jim Kenney, acknowledged the Eagles were partly responsible for Temple's pursuit of the project. The team doubled its asking price on a 30-year lease at the Linc to $2 million, driving Temple to opt instead for short-term renewals. In Tuesday's letter, Englert offered a series of thoughts and arguments in favor of building the stadium, from augmenting campus life and supporting student-athletes to raising the university's profile and delivering economic benefits to the neighborhood. "Based on my personal experience with an earlier project, I believe this project would have a long-term benefit for the university and its adjacent neighborhoods," Englert said. "Built more than 20 years ago, the Liacouras Center has become an anchor for bringing people to campus, while spurring economic development for North Philadelphia. The multipurpose facility would have the potential to do the same." Those with constructive thoughts and comments on the project are asked to send them directly to the president's office at officeofthepresident@temple.edu.